Food festivals are some of the most fun, eye-opening events you can experience. I mean, how can you go wrong with live music, games, food, and food-related events and contests? Here are a few of our favorite types of festivals, and why we love them so much! 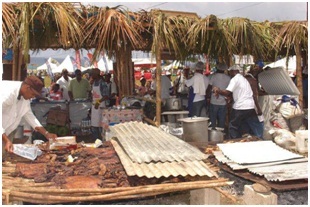 With Reggae and Calypso performances, watching arts and crafts being made and sold, jerk festivals are a great time! There’s plenty of food to eat and competitive jerk grilling contests to watch for some fun-filled family entertainment. These festivals take place all around the country at different times of the year, so you just have to keep an eye out for when they make it to your town! These festivals are always a blast. Usually held during summer, Garlic Festivals can be some of the most interesting and entertaining events you can attend. There are garlic-cooking contests, local vendors selling their crafts, and even cooking demos for the latest culinary techniques and trends. Garlic Festivals are kind of like the National Restaurant Association Show in Chicago, only smellier. 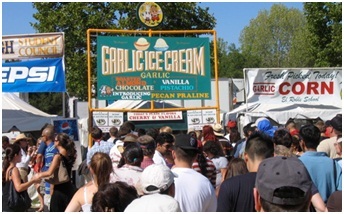 And yes, this photo does say Garlic Ice Cream! 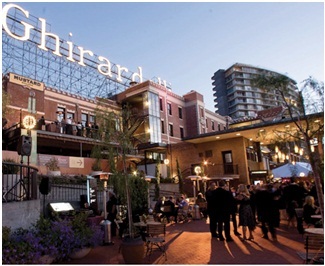 There is no place bigger in this country for chocolate than Ghirardelli Square, San Francisco. This year, from September 10-11, the streets of San Fran will be filled with the sounds of live bands, the smells of chocolate cooking demos and the sights of chocolate cooking contests. They’ve even got chocolate-inspired family activities, so the whole family can join in the chocolatey fun. This event takes place every year around this time, so if you’re on the West Coast in early September, be sure to head over to San Francisco for a treat! Perhaps our favorite type of festival, food and wine festivals have it all. Live music, celebrity cooking demonstrations, book signings, specialty shops, contests, wine tastings and food tastings. 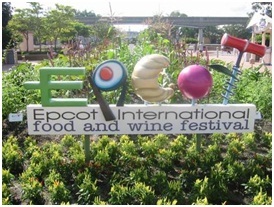 Two notable Food and Wine Festivals in Florida are in Epcot Theme Park in Walt Disney World, Orlando (September 30-November 13 of this year) and on South Beach in Miami (February 23-26, 2012). Epcot’s Food and Wine Festival is quite unique, in that it offers beverages and cuisine from 11 different countries and cultures. South Beach’s Food and Wine Festival is sponsored by Food & Wine Magazine and is a 4-day event, and is one of the largest, most well-known food and wine festivals in the country. This year, the turn out on South Beach was over 55,000 guests! It’s easy to see why these food festivals are so exciting. With everything they have going on at these events, it’s hard not to find something to do that you’ll enjoy. It’s especially fun for us here at ChefUniforms.com, because we get to see all of the chefs in their Chef attire, doing what they love to do! If you’re planning on hosting your own cooking demo at the next festival, make sure you’re comfortable and customized in your favorite ChefUniforms.com gear!